The new official trailer for Glass, the much-anticipated third and final chapter of M. Night Shyamalan’s superhero thriller trilogy, which stars Samuel L. Jackson, James McAvoy, and Bruce Willis has arrived. 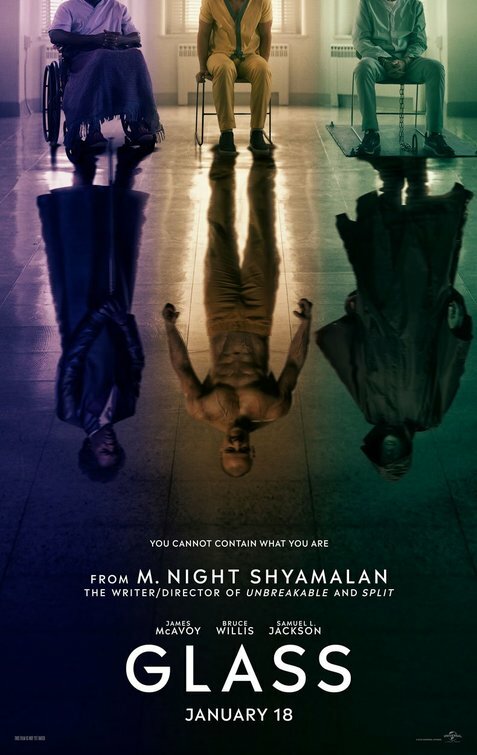 The film is a sequel to Shyamalan’s hit horror thriller Split and also his critically acclaimed comic book-tinged mystery thriller Unbreakable and brings together three of Shyamalan’s most beloved protagonists — Elijah Price a.k.a. Mr. Glass (Jackson), Kevin Wendell Crumb (McAvoy), and David Dunn (Willis) into one shared superhero universe. In Glass, Jackson’s Elijah Price, a mastermind felon who suffers from a rare genetic disorder that has made his bones easily breakable, is locked up in a mental asylum with two other fellow inmates who believe that they too have extraordinary gifts: Kevin Wendell Crumb (McAvoy), a psychotic ‘beast’ with multiple personalities and David Dunn (Willis), a former security guard who seems to possess superhuman strength, invulnerability, and a clairvoyant ability to see crimes committed by the people he touches. Price and Crumb eventually team up successfully orchestrate a prison break, leaving Dunn with a choice — either join them on their evil plan to go public or stop them before they can tell the world that superheroes exist. Emmy-winner Sarah Paulson (American Horror Story, Ocean’s Eight) co-stars as a psychiatrist who specializes in mentally ill people who say they possess superhero-like abilities. Meanwhile, Anya Taylor-Joy and Charlayne Woodard are reprising their respective roles as Split survivor Casey Cooke and Elijah’s mother Mrs. Price. “Glass” is set to open everywhere on January 18th. Tags: 2019 films, 2019 movies, Bruce Willis, films, James McAvoy, M. night shyamalan, movies, new trailers, Samuel L. Jackson, split, trailers, trilogy, unbreakable. Bookmark the permalink.